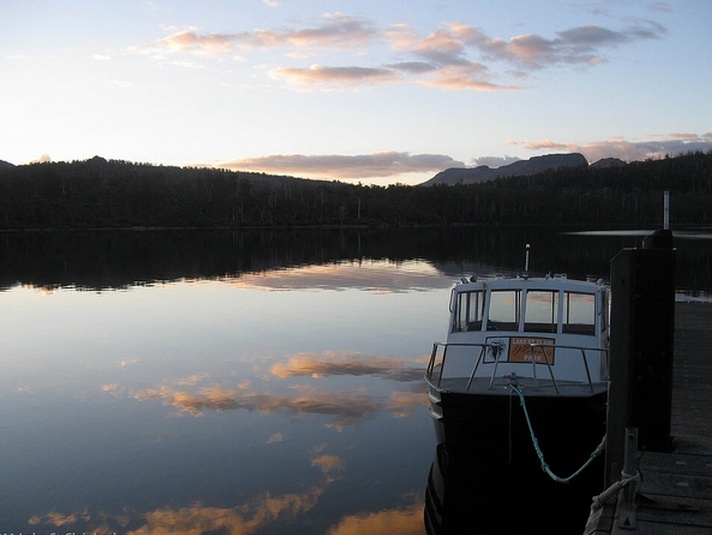 Lake St Clair Lodge is proud to provide Australia’s highest altitude ferry service. 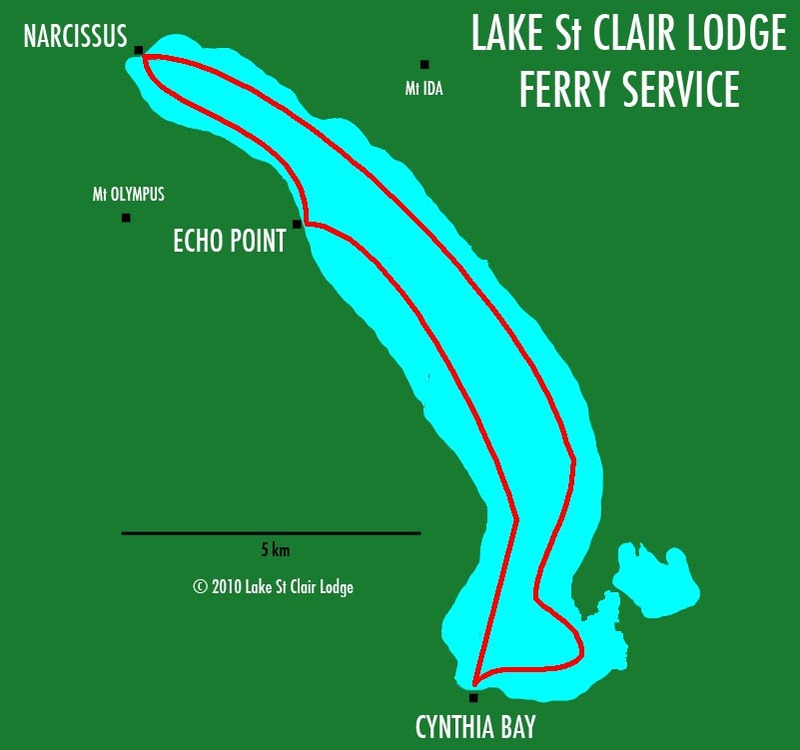 Our vessel the IDA CLAIR routinely makes the 15 nmi (28 km) round-trip from Cynthia Bay via Echo Point to Narcissus Bay and back three times daily, seven days a week during the Summer months. On the 30 min voyage passengers are treated to a truly unique perspective of the spectacular natural beauty of the National Park as they sail through a veritable dolerite pantheon formed by the encircling peaks of Mt Hugel, Mt Olympus, Mt Orthys, Mt Byron and Mt Ida. If you are planning to walk the Overland Track and intend to use the Ferry for the final leg from Narcissus Hut to Cynthia Bay we strongly recommend that you pre-book your place as many people take this option rather than walking the length of Lake St Clair.A booking will give you the peace of mind of knowing you have a spot on the day you have selected. However, we still recommend that you confirm your presence by radio call when you arrive at Narcissus Hut. If you finish early or are delayed, or did not make a booking, don’t worry, just make us aware of your arrival at Narcissus Hut via a radio call and we’ll do all that we can to accommodate you on the next available ferry. Full details of the radio call procedure for ferry confirmations are available in Narcissus Hut. Please remember to radio through to Ferry Base to confirm just prior to the Ferry departure time from Cynthia Bay so that the Ferry Master knows passengers are awaiting transport. To pre-book please call 03 62 891 137 or email sceniccruises@lakestclairlodge.com.au. * Children are under 12 years. Children under 5 years travel free. ** Pick-ups from Echo Point are possible only by prior arrangement and pre-payment. The IDA CLAIR operates all year round, but the safety and comfort of our passengers is our priority, as such, our ferry schedule is approximate and all sailings are dependent on the prevailing weather conditions on the lake. Passengers can get updates on the ferry’s status by calling our reception (03 62 891 137) or via a radio call from Narcissus Hut. The IDA CLAIR is rated for a maximum of 22 passengers, however groups with heavy packs reduce this number and our Coxswains reserve the right to limit the number of passengers to a safe limit for a given voyage. In the winter months we run voyages based on demand. Sailings for six passengers or more will run at the regular rate, however, sailings for less than six passengers will incur our minimum charge ($300).